Life isn’t what you make it. Life is how you live. Everyone chooses to be something. You can choose to change who you are and what you do every day. You can choose to be happy, sad, ecstatic, miserable, loving, wealthy, playful, tearful, joyful, mad, frustrated, and so on. The Universe reaches out to hear your choices. When you have anger, the Universe knows that you’re not ready to receive the good things you want. When you live in anger, how can you have a better life? How can you live better? Letting go of a negative attitude opens windows to possibilities. Even if the window opens just a tiny bit, from the Universe’s perspective, that window’s opening is huge! Every negative attitude you release, opens another window. In the 18th and 19th centuries in Europe, windows in a house signified wealth. Not only was glass expensive, but a tax was placed on each window. The more windows in a house required more tax to be paid. You could tell how wealthy someone was by how many windows were in their house. If you release your negativity and open windows to positivity, you become wealthy just like those wealthy Europeans. How many windows can you open to wonderful things flowing to you from the Universe? Wealth and abundance aren’t always about money. They’re about how you live your life. You may not have money to buy a house with many windows. You may not have money to take a dream vacation. But the Universe looks at all parts of your life and gives you what you’re asking for. Are you monitoring your thoughts and vibration to make sure you’re asking for what you want? 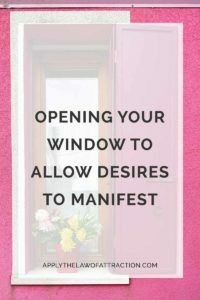 When you make sure you are consistently being a vibrational match to your desires, you can turn open windows into open doors. Choose to change more things in your life. What will it take for you to get up every morning knowing that the Universe has answered all of your desires? What will it take for you to receive the abundance from the Universe? What will it take for you to realize that you can have it all, receive it all, and live life in all its remarkable and wonderful ways? Think of the largest door that you can and see it opening, moving on its hinges. The door opens to possibilities. The doorway remains clear and uncluttered. The light streaming through the opening brings love and positivity. Bask in the warmth of the sunshine and happiness pouring through the open door. Release any negative emotions from your head and your heart. See them streaming behind you as the light flows around you. Ask the Universe for what you want. Watch your words flow into the light and through the doorway. Say thank you. Throughout the day, see the open door with the wonderful warm light infusing you with gratitude and love. The Universe has heard your choice about how you want to live your life: Positive, happy, and wealthy. You are allowing your greatest life to manifest.